31DC13 Day 2: Orange Nails - Polish This! 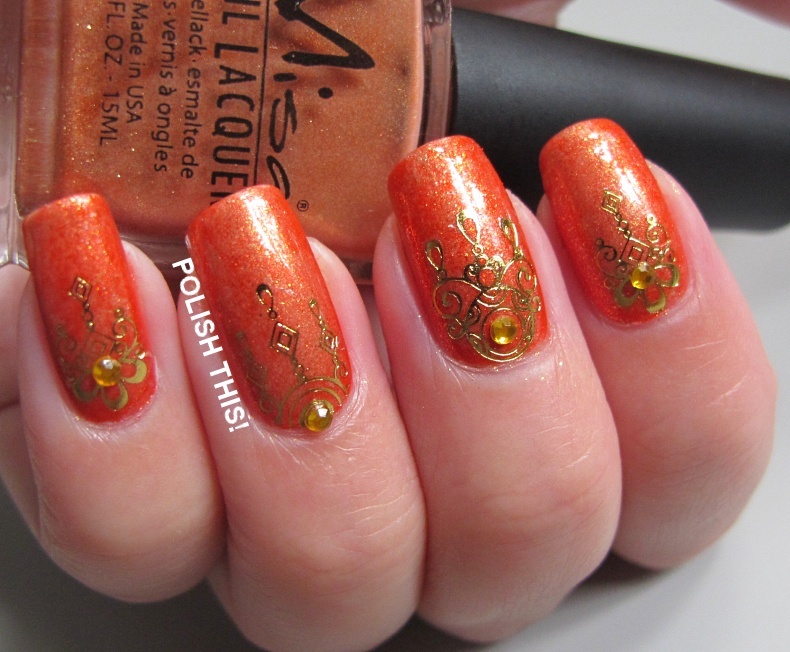 It's time for the second mani of the challenge and some orange nails! I only had one orange polish among the ones that I haven't tried out yet, so it was quite an easy task to choose it as the base color for this mani. The polish was Misa Taking Chances, which I've actually worn already twice as a pedicure so it's not really an untried one, but I haven't yet shown it here or wore it on nails. I really loved the polish on my toes, but somehow it didn't look as good on my finger nails.. I don't really know why! 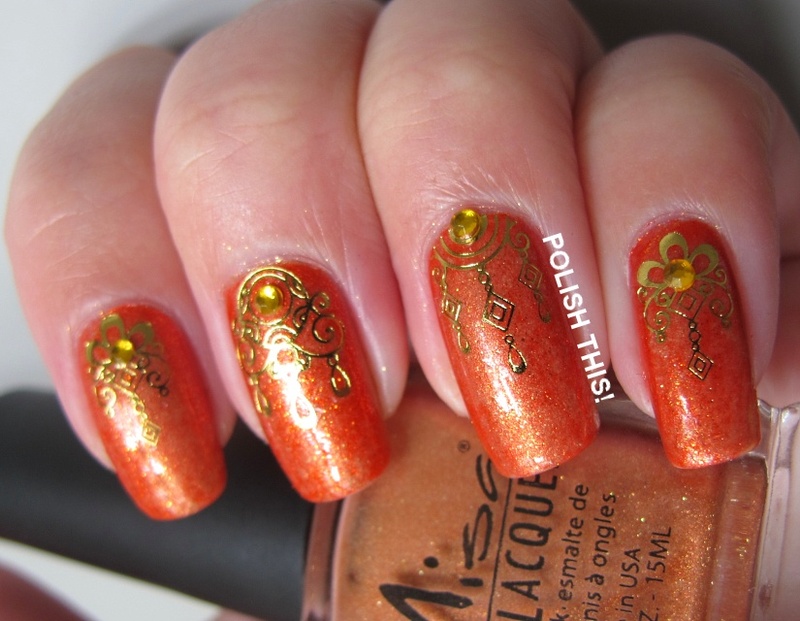 Sooo, after wearing it a while alone, I decided to do something with it as I wasn't enjoying the color too much... As this was the second day of the challenge and I needed to have orange nails, I decided to add some more orange to the mani and did a saran wrap mani with Taking Chances as the base color and China Glaze Riveting on top. I don't know if the combo of these two is really the best one out there, but at least the orange was now more my type of orange. 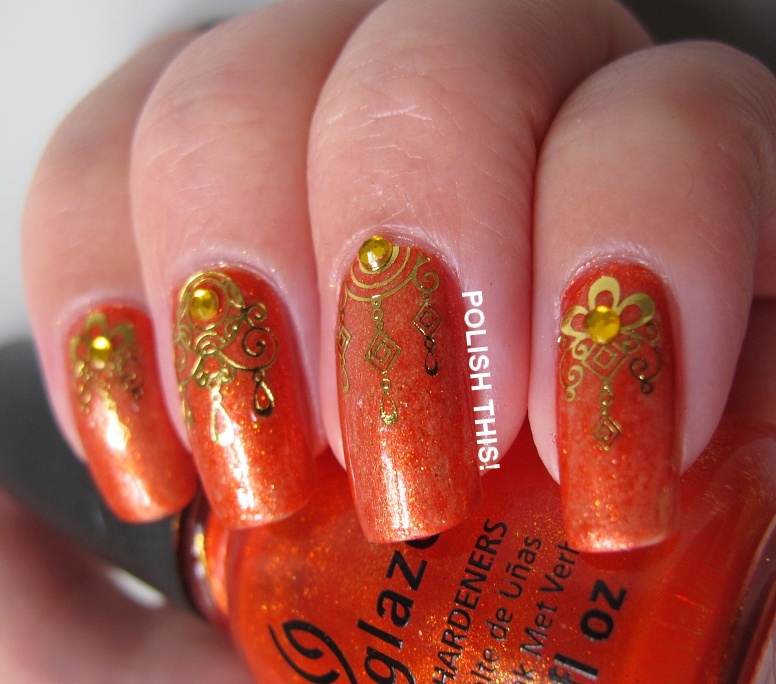 The nails looked quite pale still with only the saran wrap, so I added some gold water decals and some rhinestones. It's really a gorgeous polish, so I'm not sure why I didn't enjoy it as manicure as much as I liked it as pedicure... Weird! You can read the full post of the mani(s) here. Oi kun kivat, henkii sellaista itämaista fiilistä. Tykkään kyllä kovasti tuosta Misasta ihan omineenkin. Kaunis väri syksyyn :).